Preheat oven to 180C/160C fan-forced. Place cream, sugar and butter in a large saucepan over medium-high heat. Cook, stirring occasionally, for 5 minutes or until smooth and simmering. Simmer 2 minutes. Stir in salt. Add apple. Toss gently to combine. Spoon mixture into a deep 20cm-square (10 cup-capacity) baking dish. Make Crumble: Place brown sugar and oats in a bowl. Using fingers, rub in butter until well combined. Add coconut and pecans. Mix well. Sprinkle crumble evenly over apple mixture. 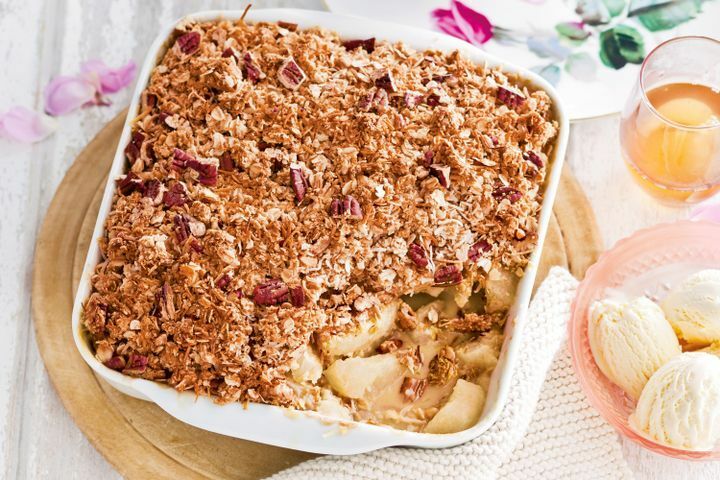 Bake for 25 minutes or until crumble is golden. Serve with ice-cream.